A darshan of Lord Ayyappa at the Sabarimala Ayyappa Temple is only complete when it is made after climbing the 18 holy steps. 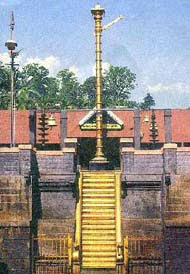 Atop the 18 steps is the shrine of Lord Ayyappa and below the 18 steps is the Aazhi or the huge bonfire lit using coconut. There is a popular belief that the 18 steps symbolically represent the 18 Puranas. Another symbolism suggests that the 18 steps are a combination of Pancha bhutas, Ashta Ragas, the three gunas, vidya and Avidya. There are also many scholars who suggest that the significance of the 18 steps is based on Yoga – as Lord Ayyappa is sitting in a yoga posture at the temple. As per yoga, in a human body the sushma nadi marga has six chakras and each has three steps. After passing these 18 steps the kundalini Shakti is believed to merge with the Brahman. So those people who believe that the significance of the 18 steps is based on yoga suggest that the huge bonfire or Aazhi on the base of the 18 steps is the Kundalini energy in a human being and this then passes through the 18 steps and merges with the Brahman – Lord Ayyappa.